On multiple cusps - spring to summer, waxing to waning daylight, Gemini to Cancer - it seemed time for an accounting, and a stroll with camera at sunset yesterday yielded the slide show below. The weeds are still worrisome but no longer have the upper hand. The tree crops are looking great, especially the apricots, figs, persimmons, plums, and quince. We'll have abundant grapes over a long season. The late-planted corn is knee-high, and the tomatoes hold great promise. Precocious winter squash and pumpkins have already produced 15-pound fruit. We have several generations of lettuce and spinach, beets in abundance, and a promising prospect for melons. And the hops are exuberant; most varieties having reached the top of the trellis wire and are spilling over. All show a heavy crop at various stages from burr to bud. A time to rejoice - and to look forward with some trepidation to the real hot weather that will drive the growth and ripening of the tomatoes and melons. In what has become a birthday tradition, I linger in bed for a few minutes and soak in bird-song, seeing how many I can identify. There's the rhythmic hoot of the grebes, the tympanic thump of the American bittern, the wild arpeggios and dry buzz of the house wrens, the melodic trill of the Nutall's woodpecker, the harsh rattle of the kingfisher, the resonant hoot of the great-horned owls and hiss and click of the barn owls, the insistent high-low call of the red-shouldered hawk, the rough grunt of great blue heron, the wild melody of the kingbird, the zip of the hummingbirds, and many more. And these barn swallows, of which we have seemingly dozens at each window, each with an insistent "feed me" whine that starts at first light and moves into a crescendo as an adult approaches. This clutch of five illustrates bird adolescence - capable of flight but not yet knowledgeable or skilled enough to secure insect food on their own, and still being fed by their parents. The fading "grin patches" are targets for their moms and dads and representative of that dependency. The thin white crescents will be gone soon and the adult-sized babies forced out to make way for another brood or two. A symphony of sound, in contrast to the growing silence in the Gulf, half a continent away, a profound overlay of sadness on what should otherwise be a season full of enjoyment of abundance and life. The hens assume, no doubt, that I warmed and softened this batch of cracked barley just for their eating pleasure. In reality, it's the spent mash from a batch of summer ale that went into the fermenter Monday evening, 8.5 pounds of English two-row malt to be precise. They are welcome to it, and to their illusions of primacy in their small and very comfortable world. The hop flower, or "burr," is predecessor to the hop cone, used to acidify and flavor beer. The hop plant is dioecious (either male or female) and almost universally propagated by division of the rhyzome. Male plants are rarely grown, and doing so is illegal in some areas of Europe because the unpollinated female flower has a higher content of desirable alpha acids. This shot from yesterday is from one of my Cascade plants. Cascade is the most aggressive of the dozen or so hops varieties that I cultivate, consistently producing more vine and more cones, earlier, than any other variety. Cascade has a distinctive flavor and is perhaps best known as the hop used to produce Sierra Nevada Pale Ale. The plant that hosts this flower is at least eight feet tall and dense with foliage. 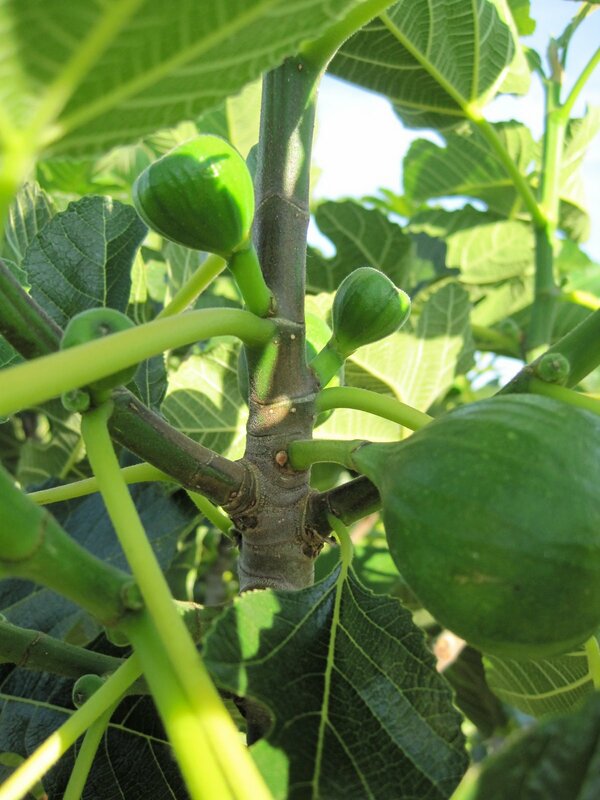 Fig trees produce two crops per year - a first, smaller crop on old wood and a main crop on the current year's growth. The first crop is called "breba" and are termed "olynths" after the ancient Greek city of Olynthus where, apparently, figs ripened early. In the photo, the branch was pruned just above the large fig (which will ripen later in June) and just below the small figs (which will ripen in August). In the literature of figs, breba are generally viewed to be of inferior quality, although I have not found this to be the case. In some articles, "breba" and "figs" are, illogically, argued to be two different types of fruit.